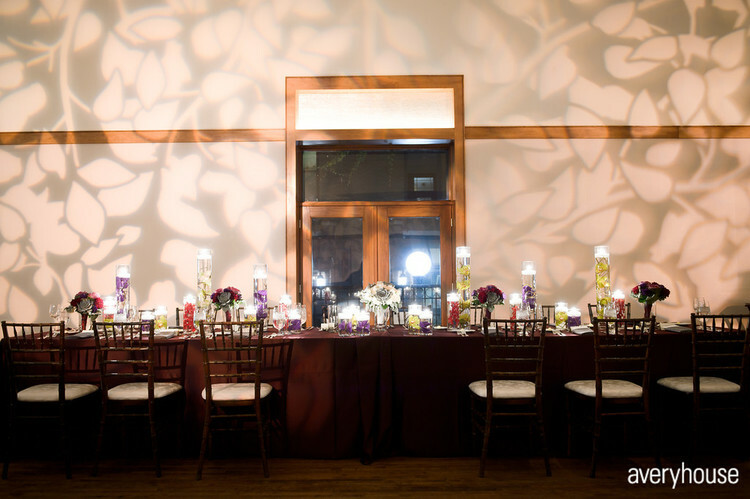 Ultimate Guide To Wedding Day Lighting — Sweetchic Events, Inc. Probably the most well known, and most commonly used type of event lighting is uplighting. A small can light or LED light is placed up against the wall, evenly spaced all around the room, and giving the space a nice 'glow'. There are generally a variety of shades to choose from. Gobo's are often recognized and used as a custom logo or monogram projected onto the wall or dance floor, as you see in this image directly below. They can also be a pattern that is projected multiple times to cover a large surface area and create texture and drama to your venue. Just imagine a small stencil that is placed in front of a spot light, which then projects your desired image onto whatever surface you'd like! Definitely on trend, string lighting can look very industrial , or a very whimsical (think dancing under the stars!). They can be hung over the dance floor or draped down walls and pillars. You can find a smaller, more cafe-like light bulb strung over the dance floor in the very first photo in this blog!! One style of lighting we can never get enough of is pin-spotting. Image a small spot light that shines on each of your centerpieces and makes them 'pop'. You've spent so much time (and money!) discussing what the florals would look like, why not show them off a bit more? We love how your centerpieces 'glow' especially after you dim the lights for dancing!